We adore the farmhouse look. Whenever we see pictures of rustic and classic country homes, we always find ourselves lusting for a farmhouse out in the country of our very own. This look is understated, familiar and warm. However, not all of us can pick up and move to the country, but we can try some fun and inexpensive DIY projects that will give our spaces a farmhouse flair. If you want to bring a bit of farmhouse decor into your home without spending an arm and a leg, then try these 30 DIY farmhouse inspired projects. Farmhouse decor has no set rules. Mix old with new, such as a dilapidated wicker basket alongside the clean lines of a metal-framed mirror. A scratched, worn wood-top table melds beautifully with an elegant glass vase filled with white roses. Place a vintage paint-chipped footstool in front of a freshly painted white cabinet. You can successfully create a farmhouse feel in your home, no matter where you live or the size of your budget. If you have a small budget, these DIY Farmhouse decor ideas are fun and cost-effective. Bargain hunt at swap meets, garage and estate sales, and thrift stores. Loving care and a few dollars can transform a neglected little bureau into a showpiece. 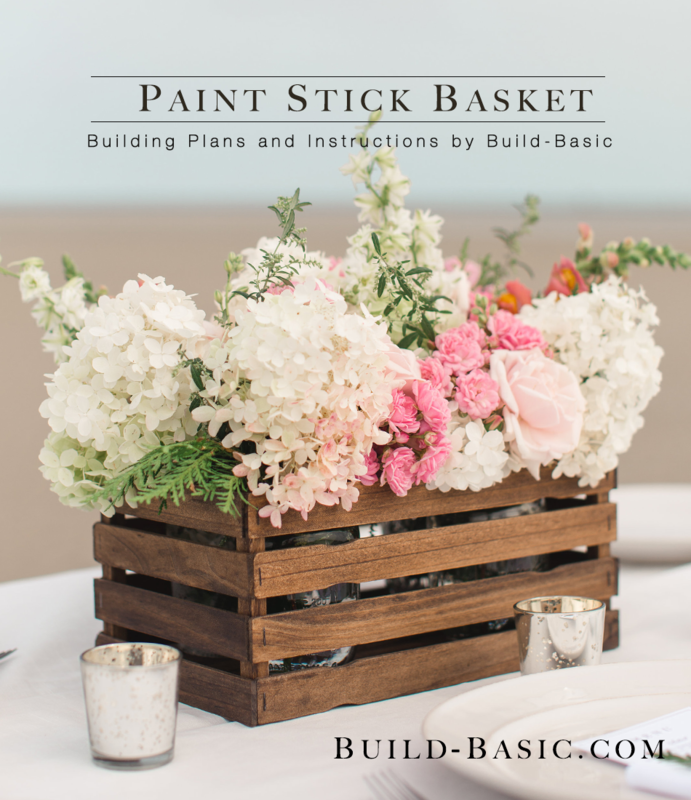 With so many tutorials and inspiration online, you can dive right in with confidence, creating a beautiful, personalized farmhouse atmosphere. 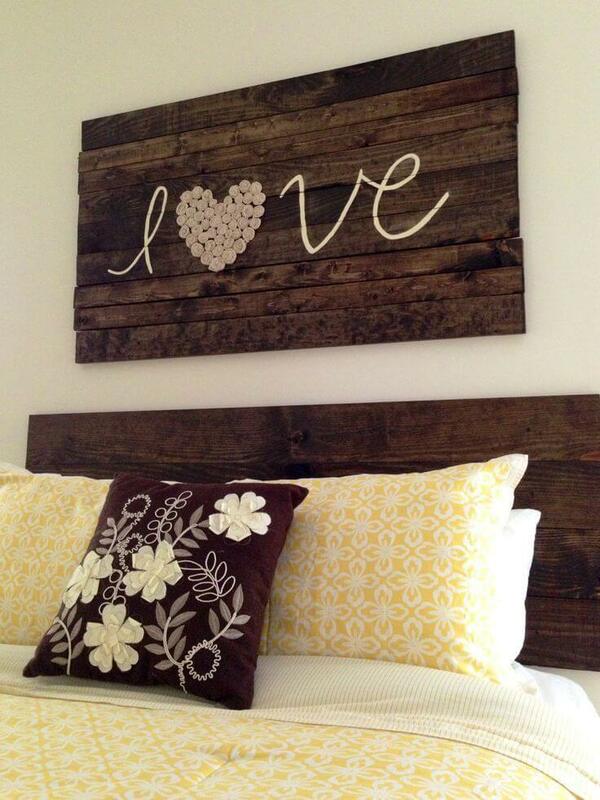 Here are 30 exceptional DIY Farmhouse decor ideas sure to get your creative juices flowing. DIY farmhouse decoration doesn’t necessarily mean that you need to make your decor item from scratch. Sometimes it means that you re-purpose a different item that you already own in a creative way. These clever homeowners took a vintage door and hung it above their bed. If you have a gorgeous vintage door that feels too lovely to hide away in a cabinet, draw inspiration from this idea. You wouldn’t believe how quickly and simply an old frame becomes a rustic, beautiful chalkboard. You can easily purchase chalkboard paint at the hardware store, which, when painted over glass, creates a chalkboard finish. As for the actual frame, spray paint it whatever color you wish. We love what these homeowners did with the gold hue. 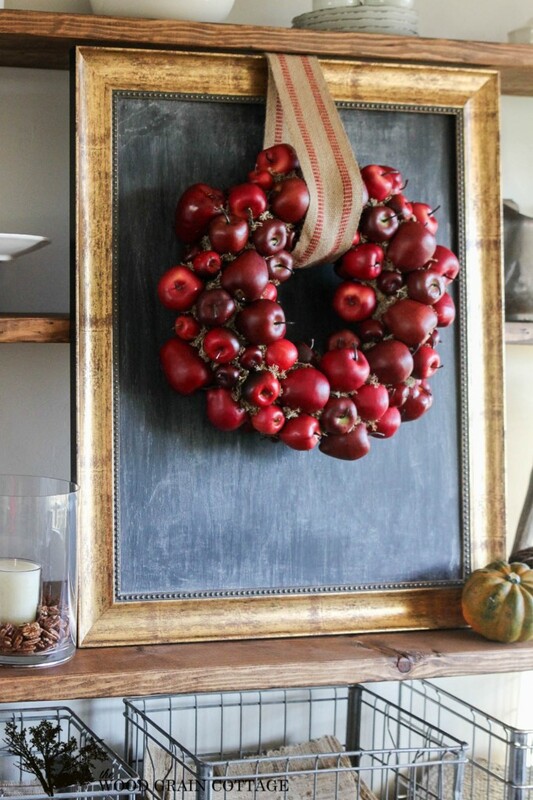 These homeowners chose not to use their DIY project as an actual chalkboard, but rather as a backdrop for a lovely cranberry wreath, which can also be easily assembled with pieces from the craft store. 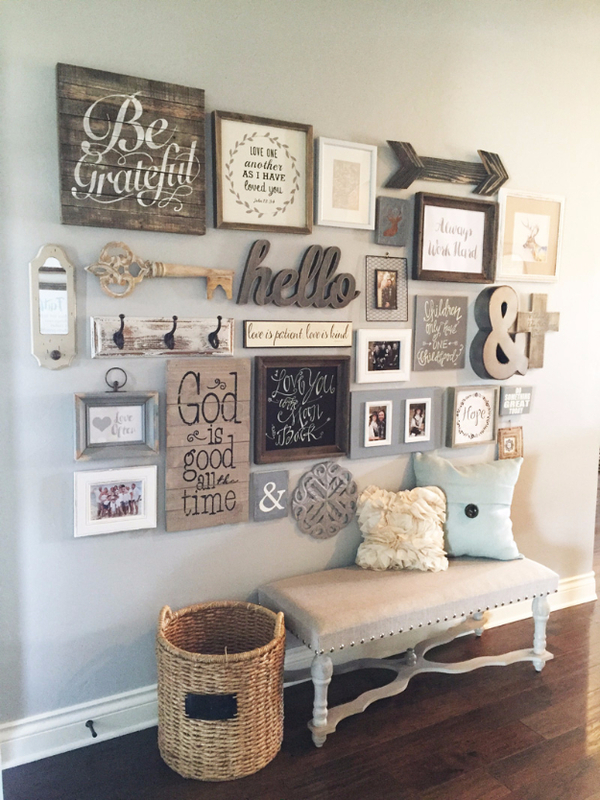 Don’t feel like you have to limit how many DIY items you display in one area. These homeowners prove that you can create a beautiful display out of several creative DIY projects. Breathe some new life into old canvases or wooden palettes by spray painting meaningful words or sayings on them. You can use a stencil if you’re not particularly artistically inclined. Or, pick up some wooden symbols, letters or shapes at the craft store and spray paint them the color of your choosing. We adore the glossy, slate colored ampersand on the far right. A mirror can be a simple and unnoticeable accent piece. However, with a little creativity, you can turn it into something truly magical. These homeowners took a wooden mirror and used paint to give it a more rustic feel, inspired by that great farmhouse style. 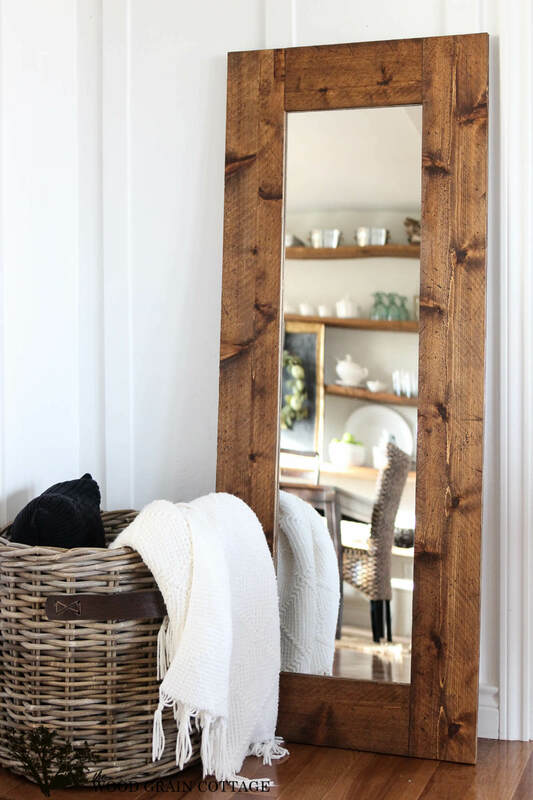 We love the light wooden stain they used, which gives the mirror a simplistic but gorgeous finished look. Farmhouse style is all about creating a home that feels warm, inviting and lived-in. This oftentimes includes taking old items and including them to give your home some classic charm. 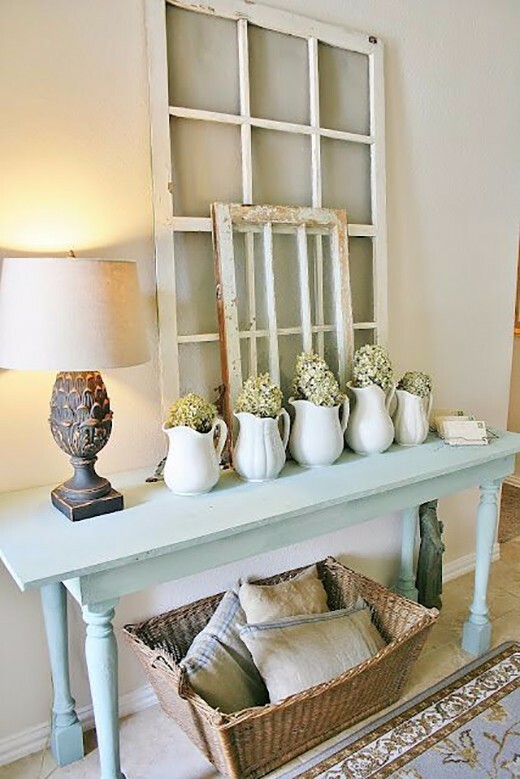 These homeowners took some old window frames, spray painted them white and turned them into an absolutely stunning decor piece for their entryway. 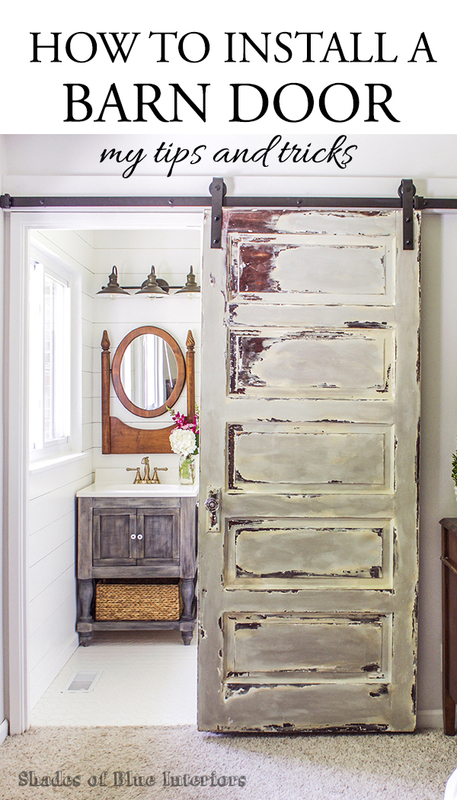 We have also seen many homeowners do similar DIY projects with old doors. If you have a garage or shed full of old wooden pieces, consider giving them a makeover with some sanding and paint. You might be stunned by the fabulous decor items that you end up with for barely any investment beyond the cost of the paint. If you think curtain rods are just for hanging curtains, you’re missing out on an entire world of beautiful home decorations. 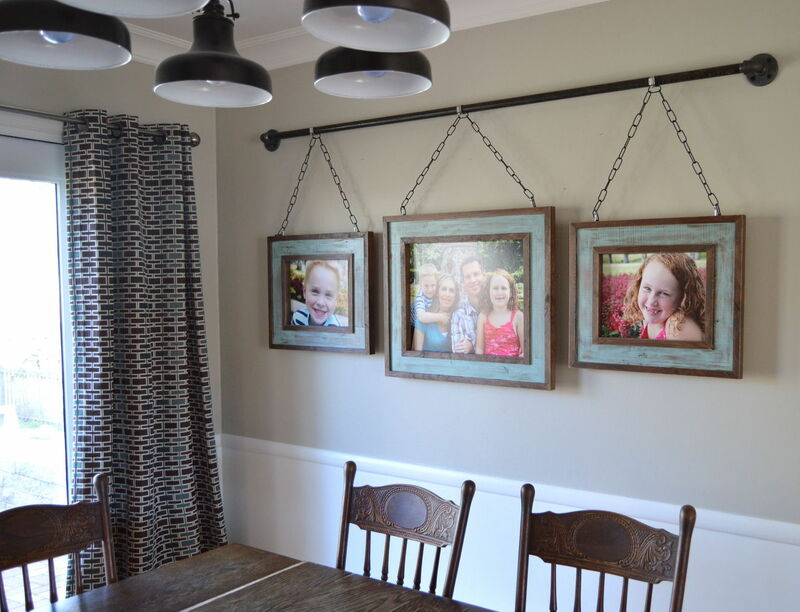 This spectacular farmhouse idea involves using a curtain rod, mounted against the wall, as a means to hang framed photos. We love this idea for so many reasons. Not only is it a creative way to display your treasured family photos, but it allows you to swap out your photos whenever you want without having to put new holes into the wall. Farmhouse style isn’t just about creating knick-knacks that look rustic and lovely. Rather, it’s often about creating items that not only accentuate the beauty of your home, but that are functional for your daily life as well. This DIY decoration is positively inspired. These homeowners took a piece of a palette, spray painted and stenciled it and added hooks. 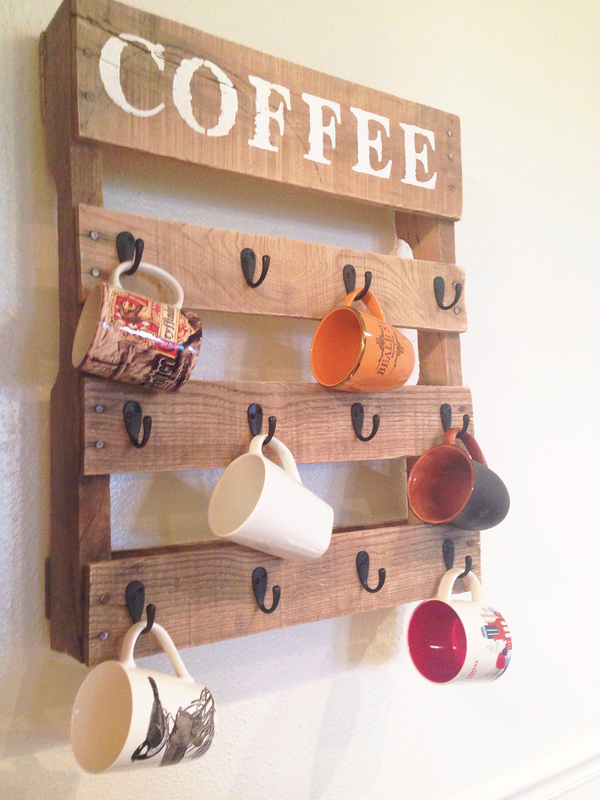 Their finished product is a pretty decor item that they can use to easily store and access coffee mugs. This is a perfect DIY project that will result in a great new item for your kitchen. Not every DIY decoration has to be complicated. 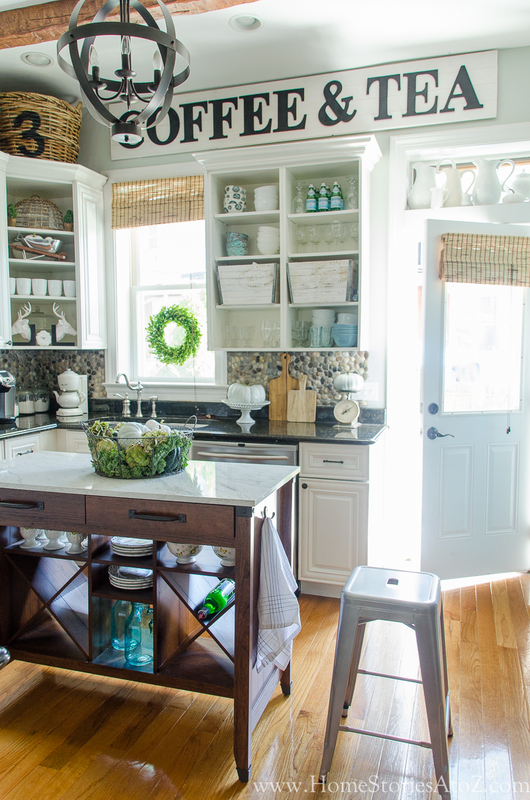 These homeowners gave their kitchen a gorgeous touch of farmhouse style by creating a very simple sign to hang high in their kitchen. To replicate it, start with a long, banner-shaped piece of thick stock board or wood. Print off your letters on your home printer in the largest font possible. Using an X-Acto blade, turn the letters into stencils. After arranging them how you want them and taping them into place, simply use black paint to fill them in. After your project has dried, it will look lovely hanging in any room of your house. If you’ve seen wooden boxes of flowers and thought it was a creative decoration idea but looked to complicated to execute, worry not. This DIY farmhouse decoration involves faking your way to the illusion of a box filled with real flowers. Start with a wooden box or crate of your choice, either spray painting it or leaving it as it is. Then, fill mason jars with faux flowers from the craft store. Place the mason jars into the box. The finished product will look like an antique box that’s overflowing with beautiful flowers. This DIY farmhouse decoration might not be functional, but it’s the epitome of farmhouse style. If you have an old length of fencing, cut it into a circle. 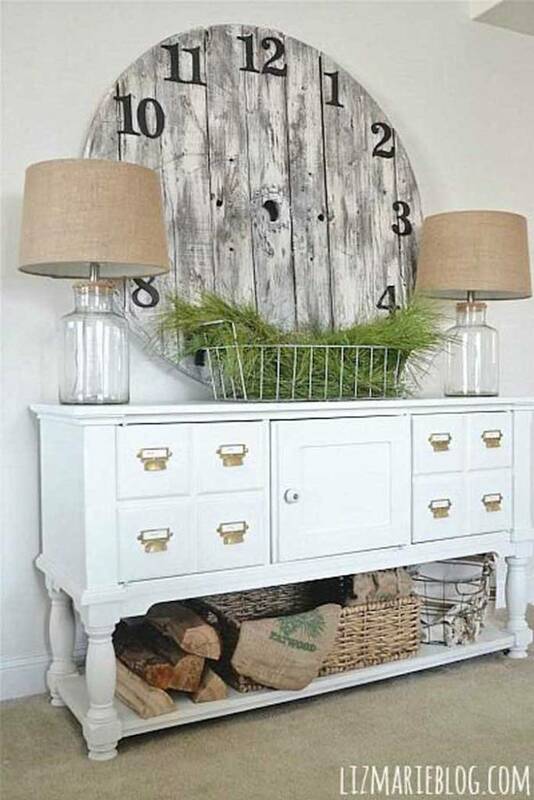 Paint it your desired color and then stencil in numbers, creating a large faux clock. This decor item looks absolutely beautiful on its own. However, if you prefer a working clock, there are kits you can buy at craft stores to create a DIY clock that actually functions. 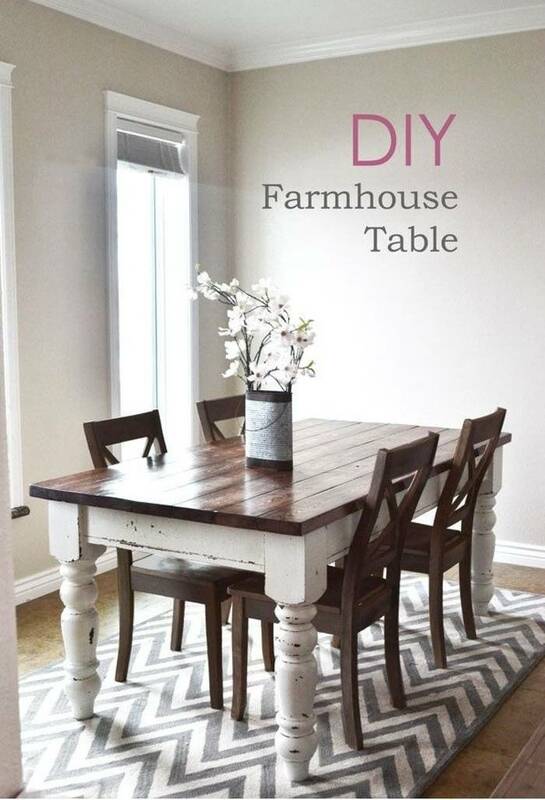 If you have an old table that could use some new life, then consider this lovely DIY farmhouse idea. These homeowners started with an antique table. They sanded and painted the base. Then, they created a new table top with planks of wood from the hardware store, stained to a dark mahogany that juxtaposes stunningly with the white of the base. This is the type of DIY farmhouse decoration that takes some work, but the finished product is so incredibly worth it. These homeowners can now enjoy a one of a kind kitchen table that is not only beautiful, but shows off their creative talents. This is another DIY farmhouse decoration that shows how endless the possibilities are when you have some old wood lying around. These creative homeowners stained a piece of wood and then stenciled in three of the letters of the word “love” in white paint. However, instead of just stenciling in an “o,” they created a heart out of pressed flowers and glued it where the “o” would normally go. The finished product is the kind of decoration that usually goes for a lot of money in high-end decor shops. This DIY farmhouse decoration will literally add a glow to your room. 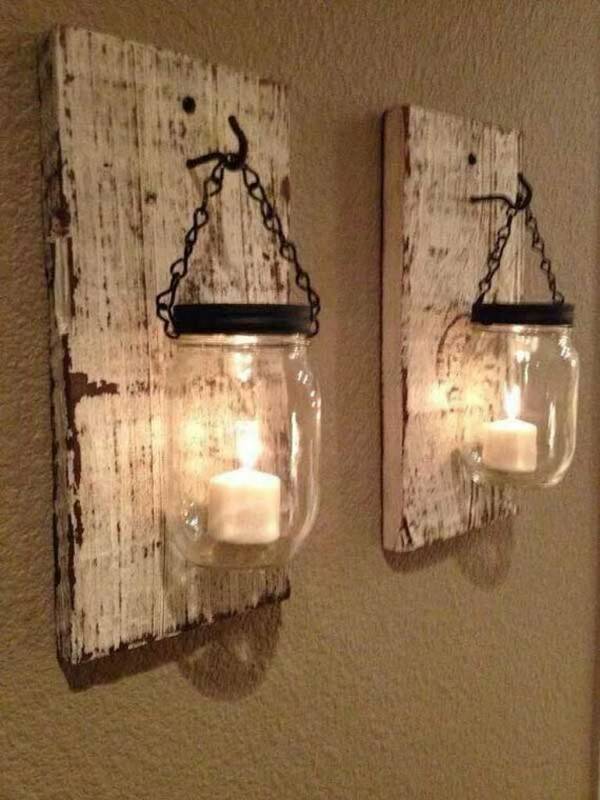 Instead of buying overpriced lantern sconces at a home goods store, these creative homeowners used some recovered wood and mason jars to create their own. First, they spray painted the wood their desired color. Then, they hand painted the upper rims of their mason jars. They attached hooks to the pieces of wood and a short length of chain to the jars. After hanging the jars on the pieces of wood, all that was needed was two candles to bring these beautiful wall sconces to life. If you’re looking for a farmhouse idea that is less of a DIY decoration and more of a permanent installation in your home, then you might want a barn door. A barn door is a door that doesn’t open and close, but rather slides on tracks. 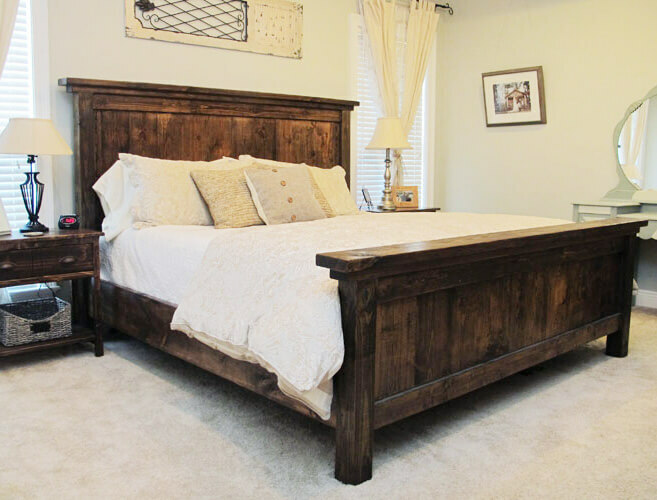 It is the ultimate way to give your home a very rustic, farmhouse feel. It looks like a complicated install, but can actually be simpler than installing a standard door. You can find barn door kits at most big box home improvement stores.